Your first Ride in Standard Kagero. The on-hit skill is basically Stern Blaukluger, and as we now, Stern (in a format without Stride) is pretty good: on-hit pressure that can kill is always welcome. The Force Gift and the fact he gets stronger still with a Soulblast is just the icing on top. Having said that, he does need a bit of smart playing to really make the most of him. 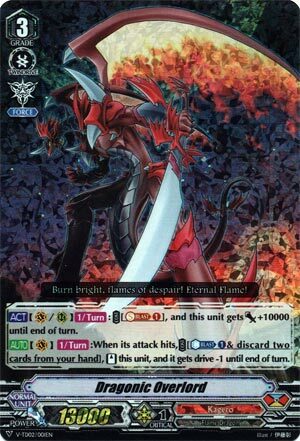 Because there’s a few column formers in Standard Kagero once the Booster Pack’s out, I would plonk his Force Gift on the Vanguard circle to try and make up the difference in Trigger values. On top of that, you need the center column as meaty as possible just so your Dragonic Waterfall play carries as much pressure as it goddamn can. But anyway, yes. Play at 4. He’s first ride, and we have no searchers in Standard, after all. What’s up, Rogue Squad?! To wrap up this week, it’s about time we have a look at the first dragon boss for most of us in the Overlord, but now the V Era version of him…so would that just make him Dragonic Overlord the V? Eh. Anyway, this new Overlord grants a Force Marker on Ride (which is always great to give) along with extra pressure with a easy paying Soulblast 1 for a +10k. Combine that with a pressurizing restand ability in a non-Stride format makes the V a threat to any clan regardless of Marker. Unfortunately, the V wouldn’t exactly be a boss unit for long as we have V-Waterfall to look forward to, but regardless, this new Overlord is still a easy 4-of. Premium: 3/5 (While good to give Markers and a 13k base, The Destiny is more than likely going to be the boss unit in this Stride based format.